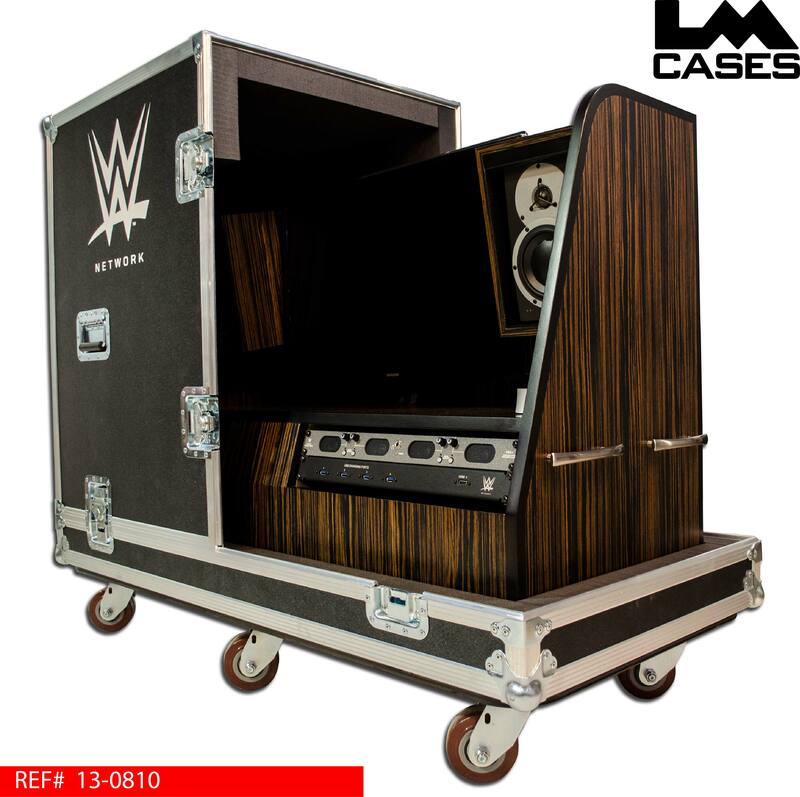 This project was designed for the World Wrestling Network as a portable monitoring station for Vince McMahon. 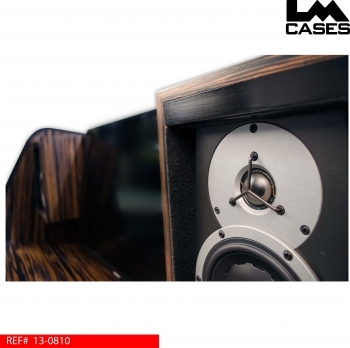 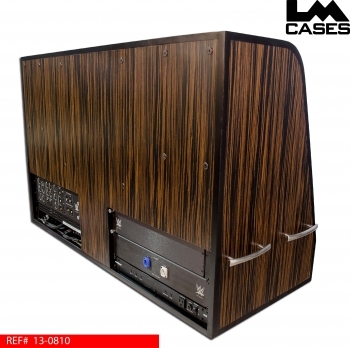 The system was designed, built, and installed by the LM Cases Custom Integration department. 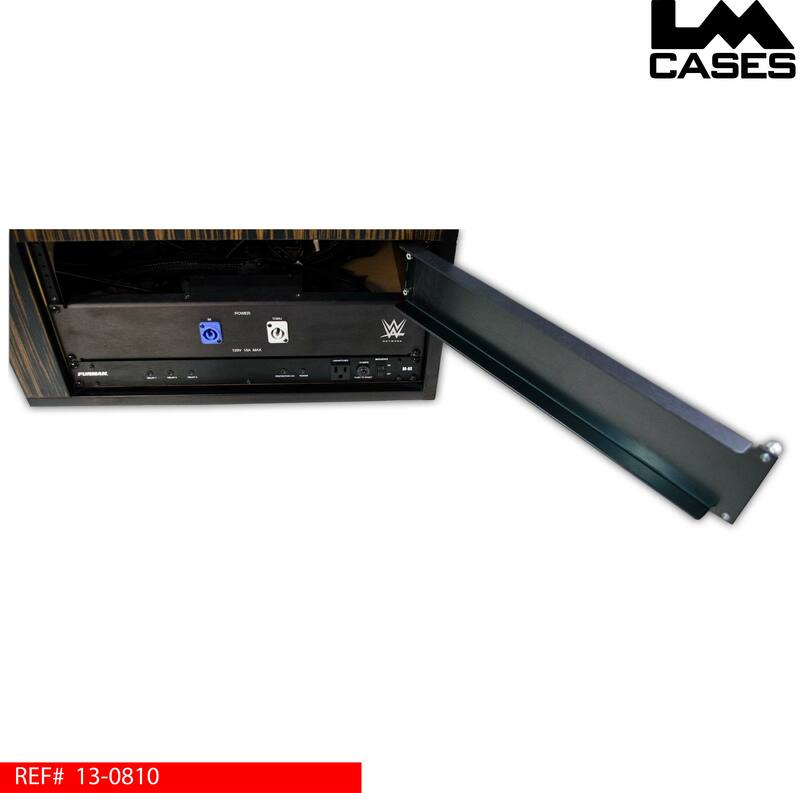 The system consists of the inner portable view station which designed to blend into corporate environments and its outer case that protects it on the road. The view station is designed to accept a variety of input signals from video feeds and provide monitoring in remote locations. The system is designed around a Samsung 32" LCD-LED TV and 2 Dynaudio BM5A Compact speakers to accept SDI, HDMI and analog component signals. For ease of use, all functions of the system are controlled via the TV like a standard home entertainment center. 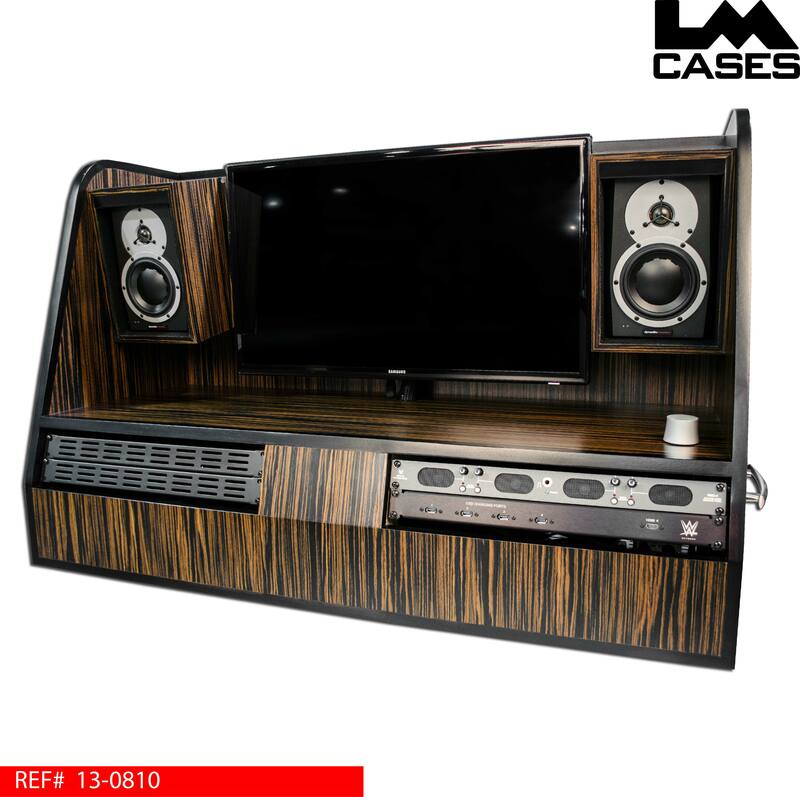 The system can also accept a silmutaneous stereo audio feed and send stereo audio out to additional speakers. 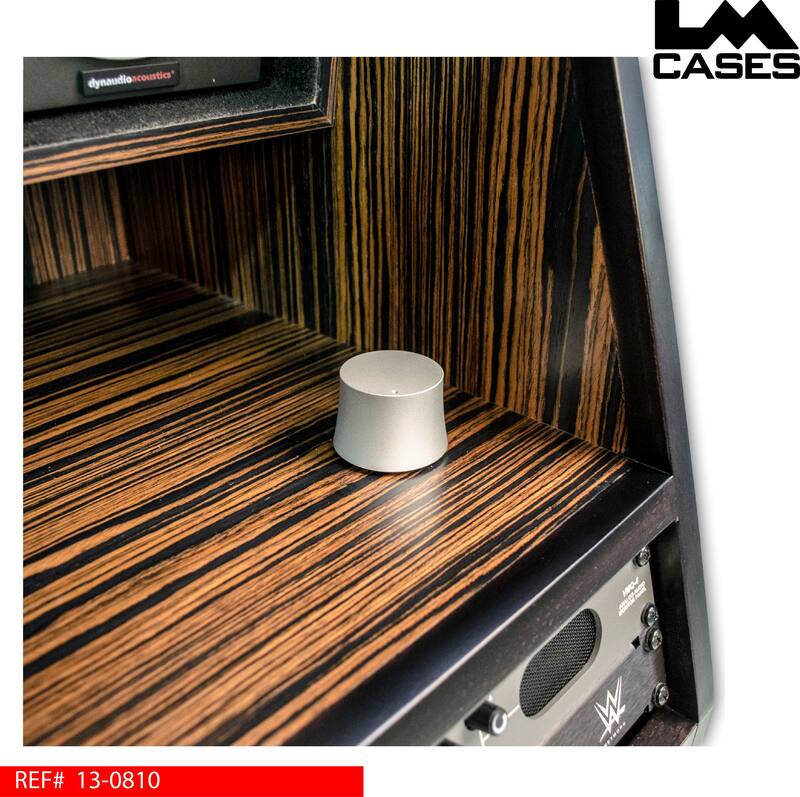 A large custom aluminum milled master volume knob is mounted within easy reach to make any volume adjustments quickly. 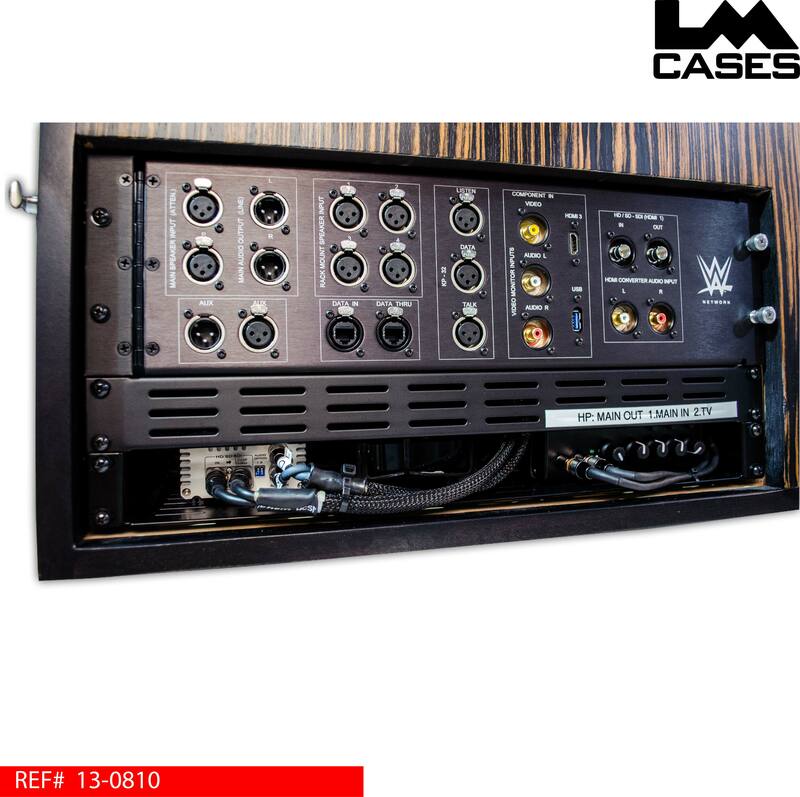 Audio can be routed to be effected by the master volume or not via the rear mounted IO panel. 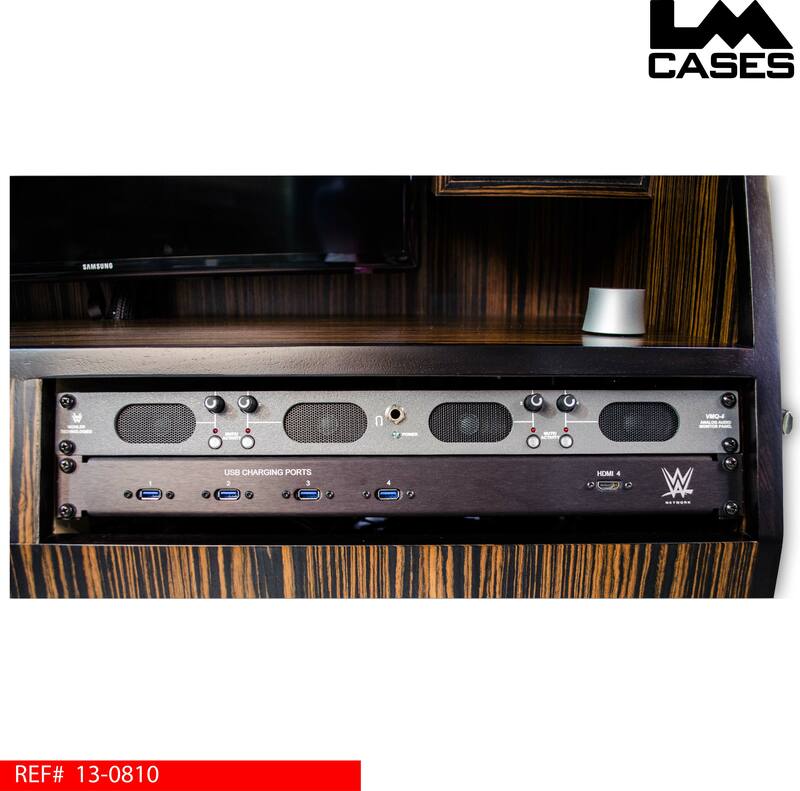 Electronics onboard consist of a wifi router to supply hardwired network to all devices in the system as well as provide an associated mobile network, a SDI to HDMI converter, Apple TV, Wohler 4 channel rack mount source monitor and a KP 32 position key panel (not shown in photos). 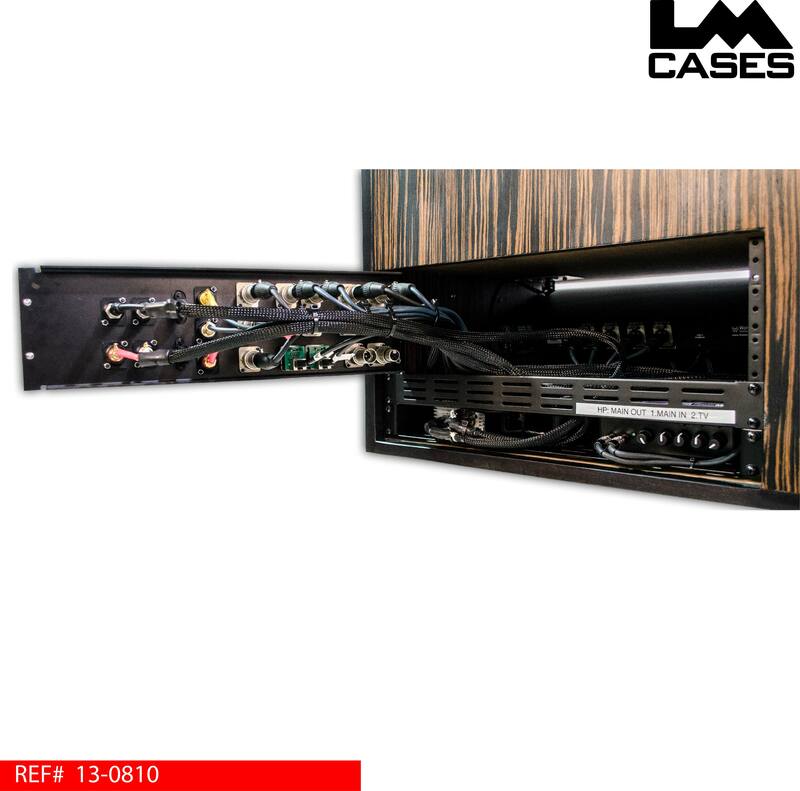 All inputs & outputs of each device can be accessed by the rear mounted hinged IO panel. 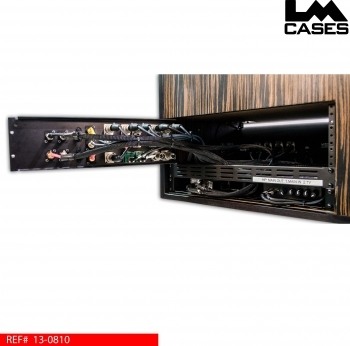 The panel is built out of .125" black anodized aluminum and can be easily opened to access internal wiring quickly. 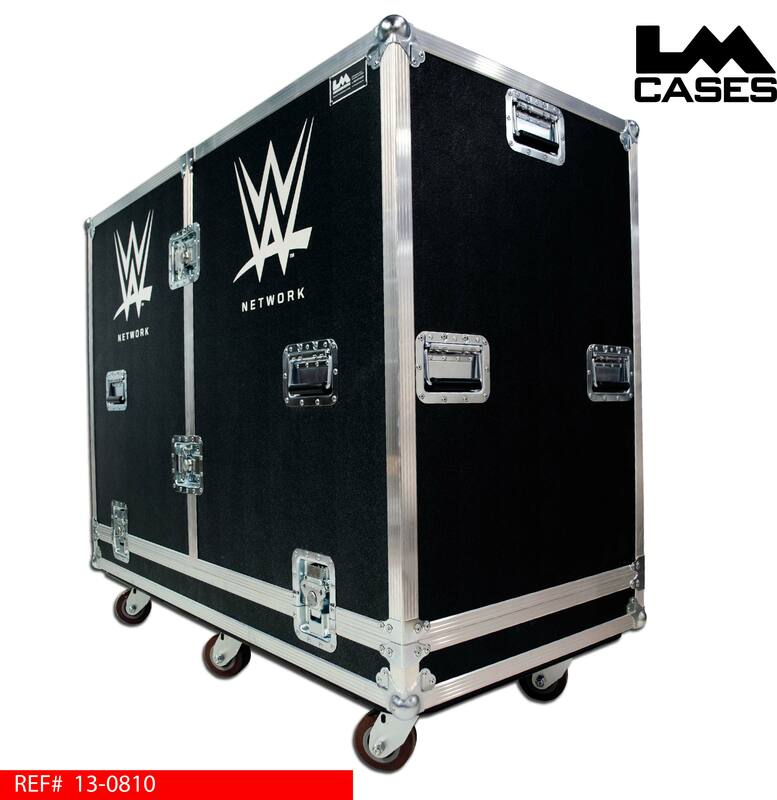 All panels are built out of .125" black anodized aluminum and feature laser etched labels as well as the WWE Network logo. The system also features 4 front mounted USB jacks used for charging any mobile device during operation. 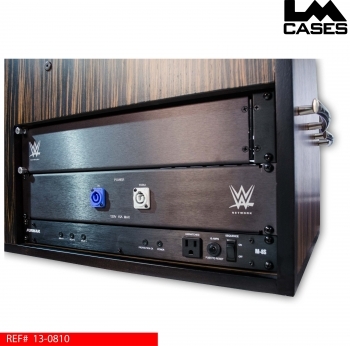 Power is handled by a custom built Powercon distro that supplies a auxillary Powercon output as well feeds a Furman power sequencer. The unit is built out of 3/4" Baltic Birch plywood that is covered with a Ebony Macassar wood veneer. 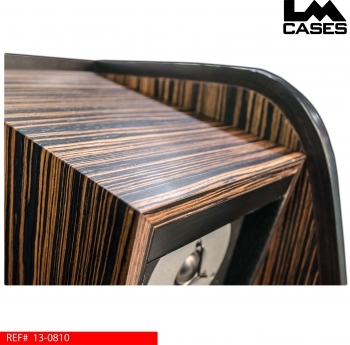 All seams and joints are grain matched which provides a "seamless" look when looking at corners and featured surfaces. 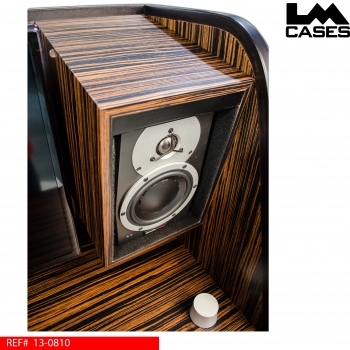 Custom boxes were built to mount the speakers at 80 degree downward angle to minimize off axis coloration during use while sitting. The unit is trimmed with a solid bent ebony wood that was moistened and hand bent to contour the units shape. 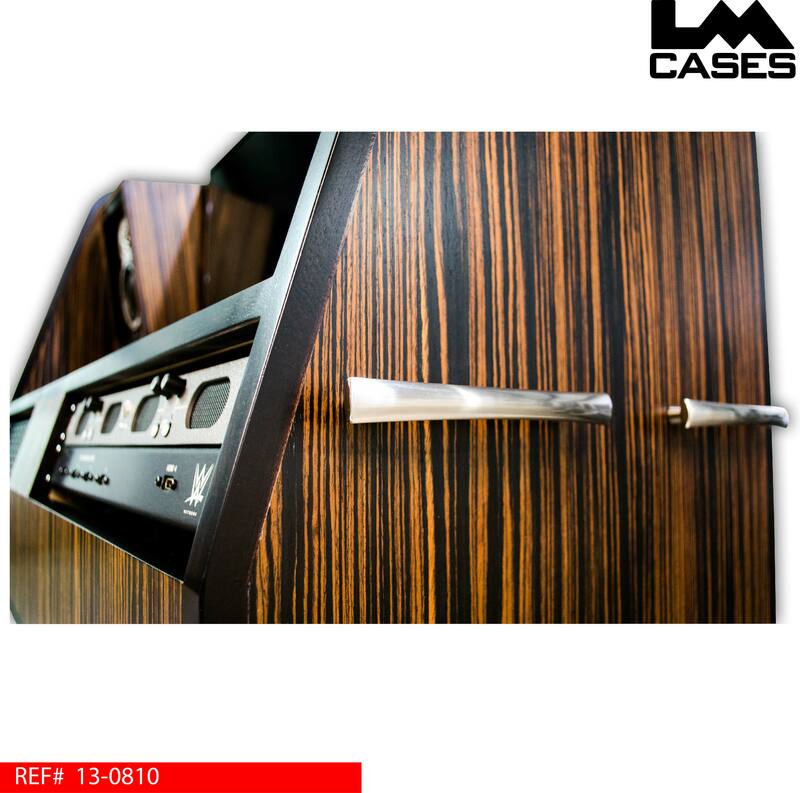 Brushed nickel handles finish the unit and allow it to be moved. 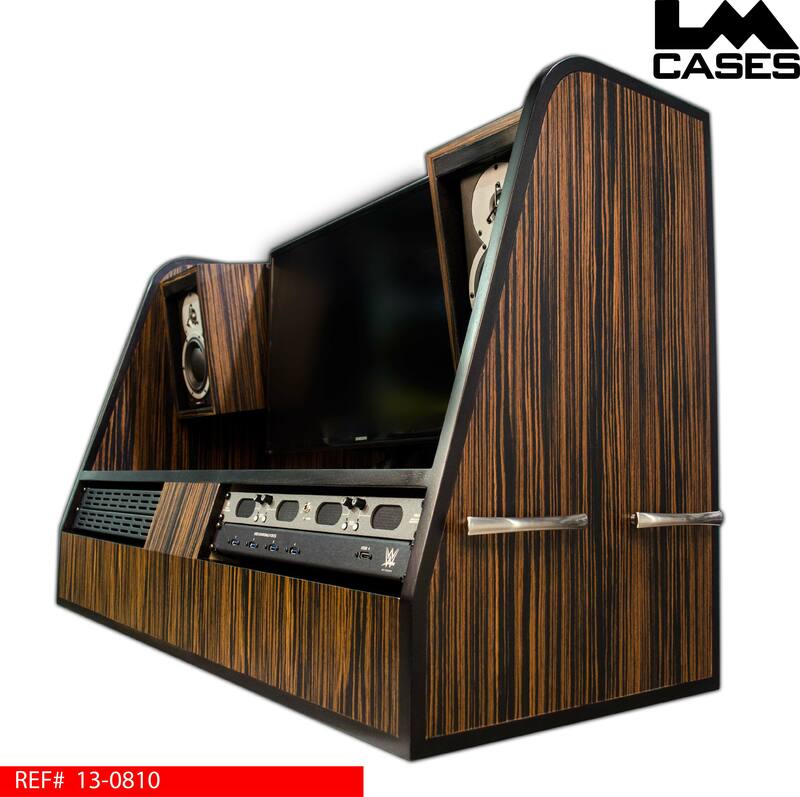 The exterior case is built out of 1/2" plywood laminated with black ABS plastic. It features 6 - 4" x 2" Colson HD casters, and a silkscreen of the WWE Network logo. Special thanks to Matt Wasilco and the WWE team for a great project!